Dealing with home buyers and buyer objections can be frustrating. Sometimes it seems like buyers are just looking around. When first encountering potential clients, they may seem defensive by not trusting real estate agents. Before engaging home buyers, try making friends with mortgage lenders, as they can qualify buyers for you. When finding out they qualify, buyers will be grateful to you. Experienced real estate agents have answers for all buyer objections. The following list of typical buyer objections offers you multiple replies, which can convert reluctant home buyers into clients. Reply: I’m pleased to hear that. You should look at all your options before buying anything. Curiously, what type of home are you looking for? Reply: OK. How many houses have you seen so far? Reply: That’s good; I’m pleased we’re meeting now. Has a real estate agent explained the home buying process or current market conditions to you? Reply: You’re starting at the right time. What are you looking for? Reply: Great! The first step is to know what you can afford. 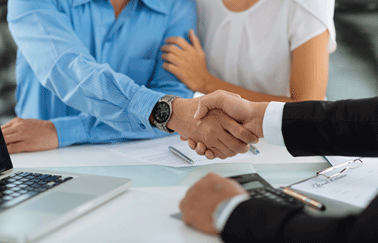 Have you met with a lender? Reply: Does that mean you feel obliged to be represented by your friend, or are you free to work with another agent who can find you the ideal home? Reply: You would be an exception if you didn’t have a friend in this business. Do you know that only 10% of all agents handle 90% of the sales in this market? Is your friend in the 10% as I am (or “my company is”)? Reply: Are you sure? Have you met with a lender yet? Reply: I understand. Do you know that some lenders have easier credit requirements? It will be worth your time to meet with a lender to see what type of a loan you can qualify for. Reply: It’s common to be unsure about your credit. Most of my clients had better credit than they thought. If you have any credit issues, a mortgage lender can help you fix them. Can I ask a lender I trust to call you? Reply: Would it help to know how much your home is worth while searching for a new one? Reply: Has a lender advised you whether you can qualify to buy a new home before selling your home? Reply: When do you want to move into a new home? Reply: Do you have to sell your current home before buying a new one? Reply: I understand. There is a lot of work to do before buying a new home, like selling your current one, dealing with lenders, finding a new home, insurance, repairs, etc. Can I help you with all that? It won’t cost you anything. Reply: OK. How do you plan to find your next home? Would it help if you can look at all homes for sale meeting your criteria on your computer first? Then you can contact me to show you the ones you like. Reply: Do you have to sell your current home first? Reply: Have you met with a lender to see what price range and monthly payments you can afford? Reply: Many of my clients felt the same way at first. Then, after spending hours driving around looking at houses they found online, they got tired and frustrated. How about letting me set up your own custom online search? Then you will only look at homes meeting your criteria. When you find some you want to see, call me and I can show you the inside. I can even have an email sent to you instantly when a new listing comes up meeting your criteria. That way you can be one of the first to see it. Reply: Fantastic, what is your friend/relative looking for? Reply: Would it be easier if I set up your friend/relative with an online search of all the homes for sale meeting his/her criteria? Then just call me when you want to see the entire house. Reply: No, that’s because the seller pays the commission. So, you won’t have to pay any commissions! Reply: No. That’s because the sellers agree to pay their agent a commission, who then shares it with me when you buy the home. You won’t have to pay me anything. This list gives you options to handle various buyer objections you’re likely to encounter. Each demonstrates the advantages of using a real estate agent. Steering buyers to a lender who pre-qualifies them creates trust in your professionalism. Remember: the best agents have answers for any and all buyer objections thrown at them. So be prepared. Starting a career in real estate? Browse our blog for tips and tools to help launch your real estate career. Check out RealEstateExpress.com for more great resources.